SINGAPORE, 11 October 2018 – As Jewel Changi Airport (Jewel) approaches its opening in 2019, travellers and local residents can look forward to a much-anticipated line-up of retail and F&B offerings. Making their debut in Jewel will be several first-in-Singapore brands such as Shake Shack, Pokémon and Läderach. The first comeback A&W restaurant in Singapore will make its appearance at Jewel. The line-up will also include familiar homegrown brands such as Tiger Beer, Naiise and Supermama, which will be introducing first-of-its-kind concepts for their stores in Jewel. Jewel will be Singapore’s first multi-dimensional lifestyle destination to integrate Nature, Play and Retail elements on a large scale. 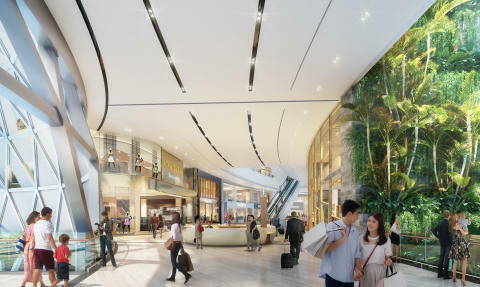 Featuring over 280 shops and eateries, of which approximately 60 percent are new-to-Changi brands, and over 30 percent are F&B operators, Jewel’s retail offerings will wrap around the Forest Valley and Rain Vortex, promising visitors a unique retail experience. Shoppers will be able to traverse seamlessly between nature and retail as they step into the retail corridors from the walking trails of the Forest Valley. Specially-created F&B units with terraces overlooking the Forest Valley will offer a picturesque view, creating an idyllic garden dining experience within an indoor environment. The distinctive Duplex Boulevard at Jewel will house large-format stores that provide retailers with a canvas to craft immersive brand storytelling universes. Exciting recreational attractions that take pride of place at Canopy Park, located on the topmost level of this landmark, round out the Jewel experience. With this rich theatre of experiences, Jewel is set to be an iconic, repeat-visit getaway for visitors to indulge in a spot of retail therapy, relax in the lush greenery or engage in timeless fun and play with family and friends. With stores across key cities in Japan, Pokémon will make its foray into Singapore. Pokémon Center Singapore will be the brand’s only permanent retail store outside of Japan. The store will offer an array of Pokémon merchandise sold in Japan as well as original merchandise exclusively created for Jewel, such as toys, stationery, Pokémon Trading Card Games and video games. Shake Shack’s first restaurant in Singapore will open in Jewel, where diners can look forward to signature menu items including the ShackBurger®, Shack-cago Dog®, classic crinkle-cut fries, and frozen custard ice cream. Fans of Chongqing cuisine will be able to savour authentic delicacies at Xiao Bin Lou (小滨楼) and Yu’s Kitchen (巴渝粮宅), two well-loved food brands with rich history from China. Xiao Bin Lou, with a heritage of more than 50 years, is a fine-dining restaurant that will feature theatrical performances showcasing Chinese culture and heritage, alongside a retail space for traditional handicrafts. Yu’s Kitchen is a casual diner that will comprise a collection of popular Chongqing epicurean brands under one roof. Together, both restaurants aim to provide diners with a peek into Chongqing culture through food. As the fast-food empire celebrates their 100th year anniversary in 2019, A&W fans will be excited to know that Jewel has been selected as the choice location for their comeback store in Singapore. The eatery will offer all-time international favourites, such as Coney Dogs and A&W Root Beer floats, and a Jewel-exclusive menu curated from a list of best-selling items from around the world, such as A&W Cream Cheese Burger from Japan and Golden Aroma Chicken from Indonesia. Making its entry into Singapore and Southeast Asia at Jewel, Pink Fish, the world’s first fast-casual seafood restaurant, will offer a different spin to the typical notion of fast food. Available in a mere span of five minutes, premium quality salmon directly sourced from the Norwegian fjords will be creatively served in delicious salads, wraps, burgers, hotpots and poké bowls. Food-lovers with adventurous taste buds need not look far with the introduction of TONITO, a brand-new Peruvian concept that promises an authentic taste of Latin America. Classic ceviche dishes with a Peruvian twist as well as the iconic Pisco Sour cocktail will soon be easily available to visitors at Jewel. Dessert lovers can soon rejoice as popular Swiss artisanal chocolatier, Läderach, launches its first Southeast Asian outlet in Jewel. As part of the collaboration, Läderach will also introduce gift packaging options unique to Jewel. Sporting giant Nike will open its largest outlet in Southeast Asia, offering a different experience from its other stores by bringing together a full suite of sports and lifestyle categories. Besides an extended range of running, training, trendy lifestyle, football and basketball products, shoppers can even customise their own Nike tee in-store at Jewel. Flying the flag high for Singapore brands in Jewel, Tiger Beer, a national icon with numerous international accolades, will unveil a first-in-the-world Tiger Street Lab. The concept store will provide a special F&B experience interspersed with retail elements. Tiger Street Lab will also introduce exclusive-to-Jewel seasonal brews, inspired by elements of Singapore and fuelled by local ingredients. The exciting menu will feature Tiger’s range of beers paired with the best of Singapore’s street food, for that uniquely Singapore experience. Local design retailer, Naiise, will launch a brand-new concept at Jewel. Named Naiise Iconic, the store will offer in-store activities and a café concept – turning the store from just a regular retail stop into interactive lifestyle experience. Local gallery store Supermama, another home-grown brand name best-known for its exquisite gifts and souvenirs, will carry a customised range of porcelain designs, inspired by and produced especially for Jewel. Jewel is also honoured to be able to play a part in the cultivation of aspiring local talents in the culinary arena – namely with El Fuego by COLLIN’S®, a specially-created Halal European restaurant helmed by 25-year-old Chef Koh Han Jie. Chef Koh is the first Singaporean to win the prestigious Young Talent Escoffier Asia 2018 culinary competition. The restaurant is a collaboration with industry veterans Chef Edmund Toh (President of Singapore Chefs’ Association) and Chef Collin Ho (Founder and chef of COLLIN’S® chain of restaurants). Rounding up the list is the grand dame of Singapore cooking Violet Oon and her largest restaurant to date. At more than 350 square metres the restaurant at Jewel will feature popular local delicacies such as Dry Laksa, Beef Rendang, Satays and Roti Jala. Travellers hoping to bring a piece of Singaporean food culture home can look forward to food souvenirs such as Gula Melaka cake or pineapple tarts for their family and friends. Ms Hung Jean, Chief Executive Officer of Jewel Changi Airport Devt, said, “It is our vision for Jewel to be a unique destination like no other. Our thoughtfully curated tenant mix reflects Jewel’s aspiration to be a place where ‘Singapore Meets the World, and the World Meets Singapore’. We hope to showcase Singapore to the world, positioning it as the platform where local brands will be exposed to an international audience; while simultaneously bringing new and familiar global brands to Singapore. “Travellers today have grown more discerning about their destinations and their choice of airports to stopover. With this in mind, we hope to create a one-of-its kind, multi-dimensional destination at Changi Airport to fulfil these travellers’ needs. We firmly believe that Jewel’s unique retail proposition will enhance the overall Changi Experience for the millions of travellers who pass through Changi Airport and attract more visitors to Singapore. Jewel is scheduled to open in 2019. Jewel Changi Airport Devt is the property owner of Jewel Changi Airport (Jewel), a world-class multi-dimensional lifestyle destination in Singapore. Jointly developed by Changi Airport Group and CapitaLand, Jewel is located at the gateway of Changi Airport.